When potential students’ parents call, do you struggle with figuring out what to say on the phone? What information are they looking for, anyway? This post offers some ideas and suggestions. First, offer basic information about your studio. How often and how long are lessons. About other studio events: i.e., group lessons, the Spring Recital, the Christmas Party, the Summer Music Camp, etc. About other perks of your studio: i.e., lending library, SAT testing, lab time, incentive programs, etc. A little about yourself: how much you enjoy teaching, how long you’ve been teaching, what your teaching philosophy is (in a nutshell), or what your goals for your students are. Cost of tuition (save for last whenever possible), and what forms of payment are acceptable. Specify whether or not the cost of books and materials is included. Direct them to your studio website. There, they can perhaps find more studio information, your bio, pictures, audio files or videos, and forms/handouts such as your Studio Policies. Offer references. Talking to happy parents of current students is a great way to learn more about the studio. Offer a free trial lesson/interview with no obligation. This not only allows the parents/student the chance to meet you personally before making an obligation, but also allows you the chance to meet the student before officially accepting them into your studio. Before hanging up, be sure to ask if they have any other questions. And always thank them for calling, whether or not they sound interested in taking lessons with you or not. What kinds of things do you make a note of telling potential students/parents? 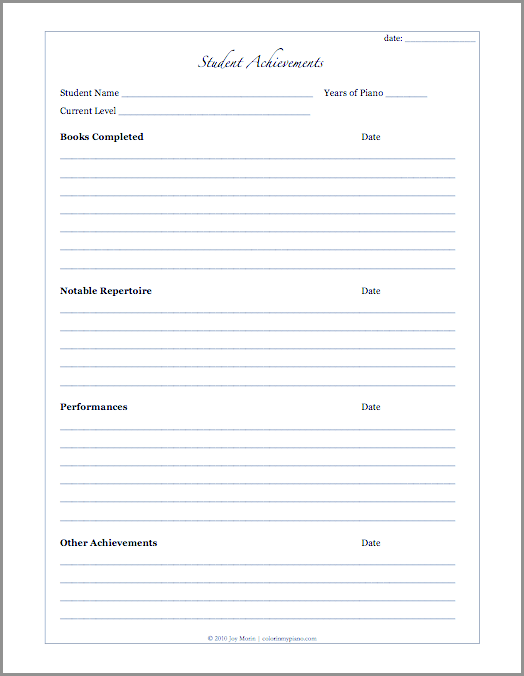 This printable is designed for the teacher to keep records of each students’ achievements, including the completion of music books, the completion of notable pieces of repertoire, the performance of a piece for an audience, and other achievements. Keeping such a record is helpful for the teacher to track and evaluate student progress and participation from year to year. Suggested use: print a page for each student and keep the pages in alphabetical order in a 3-ring binder. What difference does it make how closely you follow the markings in the score? Listen to these two recordings and see what you think! This is a concert etude by Franz Liszt entitled, Waldesrauschen (meaning, Voices in the Woods). The first version is played by Josef Hofmann and the second is by Claudio Arrau. I would also like to point out however, how you can truly hear the markings in the score in the second interpretation. For example, the LH melody in the opening 15 seconds of the piece contains a couple of phrases that each contain a note with a tenuto. Can you guess which note of each phrase has the tenuto, without consulting the score? Another example, during one of the tumultuous middle sections, there are two crescendos marked in two consecutive measures (2:35 in the first YouTube video; 2:30 in the second). Arrau truly takes the time to make these come out. Anyway, I think it’s really fascinating to listen to various interpretations of the same piece – to get inspired to create my own personal interpretation! Just recently, I’ve realized that when I play piano, I hold a “knot” of tension in my back, in the space between my shoulder blades. Upon this realization, I have begun making a conscious effort to release this tension while I am practicing – which I have to do constantly. It’s obviously a bad habit that I’ve been unaware for a long time! Interestingly enough, it seems to be related to another issue which I’ve been aware of since my freshman year of college: I tend to raise my right shoulder when I play, especially in anticipation of difficult passages in a piece. Raising my shoulder, however, actually hinders my arms/fingers in those difficult passages rather than helping. I have to remind myself not to “freak out” in anticipation of those upcoming passages so that I keep my shoulder comfortably in place. Now that I am focusing on releasing the newly-discovered tension in my back, however, I have found that the shoulder problem is occurring less. It seems that I may have found the root of the issue! My back feels better, which means my shoulders are feeling better, which in turn means my arms and wrists are feeling better. And difficult passages are going much better than ever before, which is amazing to me! Do you deal with tension when you play? Have you been able to identify the root of the problem? I am very interested in hearing more about how to prevent/deal with tension! 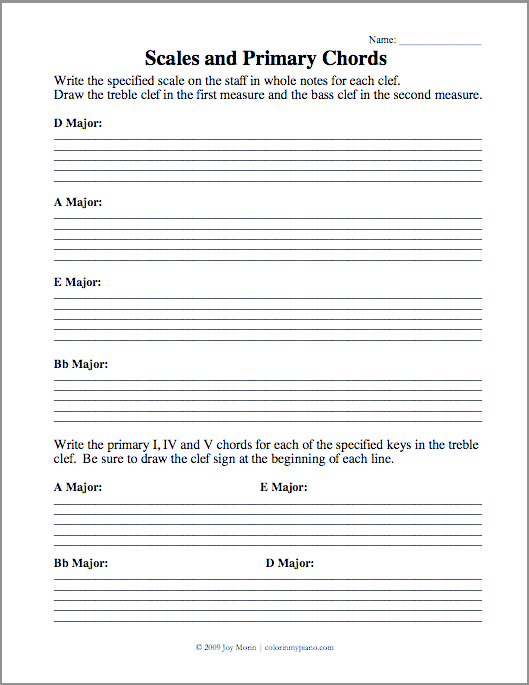 This worksheet is a continuation of set of worksheets that practice writing out scales and primary chords on the staff (click here to view the first one which is for the keys C, G, D, and F, click here to view the second one which is for D, A, E, and Bb, or click here to view the third one which is for Bb, Eb, Ab, and B). 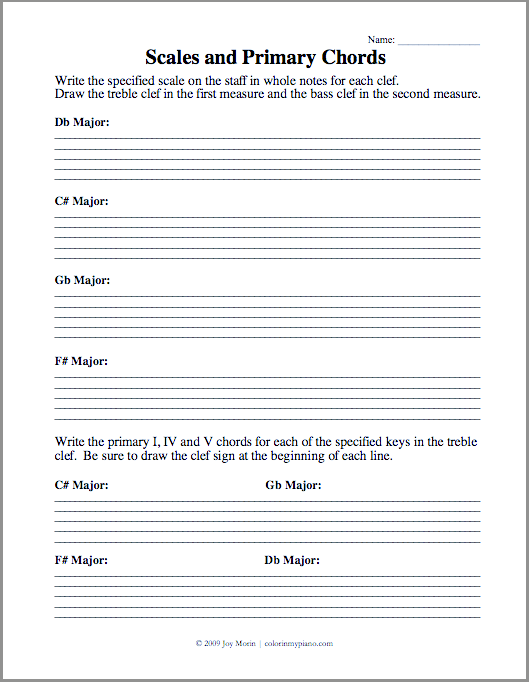 Ideally, this worksheet is designed for the intermediate+ student who is already familiar with the scales and primary chords for the keys of Db, C#, Gb, and F# major, and perhaps could use some review in writing them out on the staff. However, this worksheet could also be used during a group lesson while introducing these ideas for the first time. An understanding of key signatures for Db, C#, Gb, and F# major. Practice writing out primary chords. Every Wednesday brings Words of Wisdom here at the Color in my Piano blog in the form of a musical quote or joke, intended to bring inspiration or humor to the middle of your week. Have suggestions? Send an email off to admin[at]colorinmypiano.com. This worksheet is a continuation of set of worksheets that practice writing out scales and primary chords on the staff (click here to view the first one, which is for the keys C, G, D, and F, or click here to view the second one, which is for D, A, E, and Bb). Ideally, this worksheet is designed for the intermediate+ student who is already familiar with the scales and primary chords for the keys of Bb, Eb, Ab, and B major, and perhaps could use some review in writing them out on the staff. However, this worksheet could also be used during a group lesson while introducing these ideas for the first time. An understanding of key signatures for Bb, Eb, Ab, and B major. One more worksheet in this set is on the way! On the post about the Summer Piano Mini-Camp a few weeks ago, Jennifer commented: “I have been toying with offering something similar on a regular basis. Do you happen to know anything about insurance issues for students?” What a great idea – and what a great question! I have to admit I don’t know anything about insurance options. Perhaps some other readers do, though! Click here to view her comment. Dealing with Frustration: Be Okay with Mistakes & Keep it Fun! At a piano lesson this week, I observed my student grow increasingly frustrated with herself whenever she made a mistake. She would “growl” at herself and start back at the beginning of the phrase. After observing this continue for a few moments, I decided to stop her and address the issue. She was growing increasingly frustrated with herself. And frustration doesn’t usually yield positive results. I could tell this was becoming a habitual response. When she is practicing at home, she is obviously doing the same thing there. We were sight-reading. She had never seen this piece before, and there was no reason that she should expect to play it perfectly upon first try. She is only 7, and hasn’t had much experience with sight-reading yet anyway. The August Forum: How do you keep your students motivated? How do you motivate your students? How do you keep them coming back year after year? How do you keep them exciting about taking lessons? How do you keep them practicing? What have you found works for your students? Have some things worked better for some students, but not for others? Please take a moment to contribute your thoughts and ideas! This worksheet is a continuation of set of worksheets that practice writing out scales and primary chords on the staff (click here to view the first one, which is for the keys C, G, D, and F). Ideally, this worksheet is designed for the intermediate+ student who is already familiar with the scales and primary chords for the keys of D, A, E, and Bb major, and perhaps could use some review in writing them out on the staff. However, this worksheet could also be used during a group lesson while introducing these ideas for the first time. An understanding of key signatures for D, A, E, and Bb major. Two more worksheets in this set are on the way!